Our paper on the extreme sensitivity of calving termini is now out in Nature Geoscience. A press release describing the significance of our work is available here. A new study, of which I am a co-author, examines globally-collected observations of iceberg calving and novel model results to present a new framework for understanding this important mass loss process. Our study explains why calving rates vary so greatly over time, and how small changes in the environment can lead to tremendous changes in calving activity. We show for the first time that calving belongs to a class of processes termed “self-organized critical.” These processes occur in the same manner over many orders of magnitude such that there is no single, characteristic event size. The calving terminus self-organizes to the point where it is always at the cusp of collapse. This property makes iceberg calving very challenging to predict. However, in our manuscript, we demonstrate one potential solution for addressing this challenge and including self-organized critical calving in ice flow models. Our paper will be published in a forthcoming issue of the journal Nature Geoscience. I recently presented an overview of my research program to date at the weekly seminar of the Univ. of Texas Institute for Geophysics. You can view it here. The largest and most rapidly changing glaciers on Earth flow into the ocean. Ice loss from these glaciers will be the largest contributor to sea level rise in coming centuries and is also the least certain component of the sea level budget. These uncertainties are driven in large part by the poor understanding of two processes by which tidewater glaciers and ice sheets lose ice at their termini: submarine melting by warm ocean water and mechanical iceberg calving. The fronts of tidewater glaciers are among the most active and inaccessible geological environments. 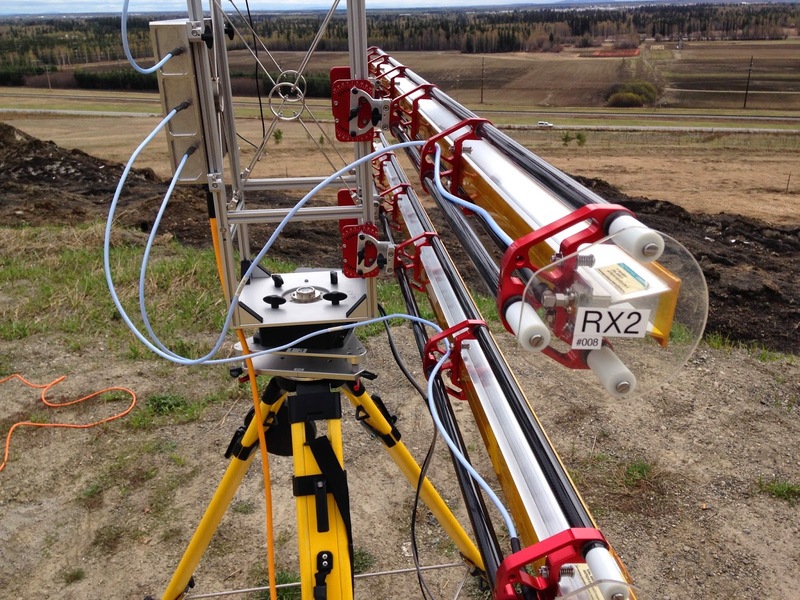 These challenges have limited the long duration, high resolution calving and melt measurements that yield insight. Using seismology and oceanography, I identify the magnitudes and variability of submarine melt and iceberg calving at Yahtse Glacier, a major tidewater glacier in southern Alaska. I find that the submarine portion of the glacier terminus melts at over 10 m/d during much of the year. In addition, cavitation of icebergs beneath the sea surface can generate seismometer-recorded “icequakes,” revealing that calving varies seasonally and in response to ocean tides. Seismic tremor also offers the first ever view of subglacial discharge from a tidewater glacier. Discharge increases during late summer, which promotes submarine melt. Together, these multidiscipline observations improve our understanding of the geophysical processes responsible for rapid ice loss across the cryosphere. Earlier this month, our joint Univ. of Texas and Univ. of Kansas team returned from West Greenland, where we collected data regarding the behavior of ocean-terminating glaciers in a major fjord system. Many of the sensors we visited, including GPS receivers, seismometers, weather stations and time lapse cameras, had been recording data for a year, since we installed them in August 2013. While in the field, we also had the opportunity to camp at the terminus of Rink Isbrae (71.5 degrees north latitude) for 10 days. During that time of focused terminus observations, we were able to scan the terminus with a radar system every 2.5 minutes to detect detailed variations in the speed at which the glacier was moving. Our team of 5 scientists had a great time working together and developing a better sense for how these beautiful and rapidly changing glacier/ocean systems work. Together, our data will allow us to better understand the factors that lead to increasing and decreasing glacier stability. Ultimately, this understanding will allow the glaciological community to make better projections of future glacier change- the leading contributor to the increased sea level anticipated this century. In this photograph, our field team resets a GPS station on the ice. Stations such as these allow us to identify the response of the glaciers to ice melt, rain, glacier thinning, and iceberg calving events. At the annual meeting this December, I’ll be making an invited presentation and co-convening a different session. On behalf of AGU’s Cryosphere focus group, I am serving on the meeting planning committee. The fall meeting of the American Geophysical Union is the largest meeting of geophysicists, including cryosphere and climate scientists, worldwide. This year, my involvement in the annual meeting is greater than ever. I’ve been invited to give a presentation on the links between glaciers that flow into the ocean and their fjords, and I’m co-convening a different session on a similar topic. With Adam Winstral, a snow scientist, I’m serving on the meeting’s program committee to assist with scheduling the nearly 40 different sessions that will be available under the Cryosphere umbrella at this year’s conference. I’ve recently co-authored an accessible review of recent research into iceberg calving. You can read it by clicking here. Approximately half of the ice loss from the Greenland Ice Sheet occurs where glaciers flow directly into the ocean. 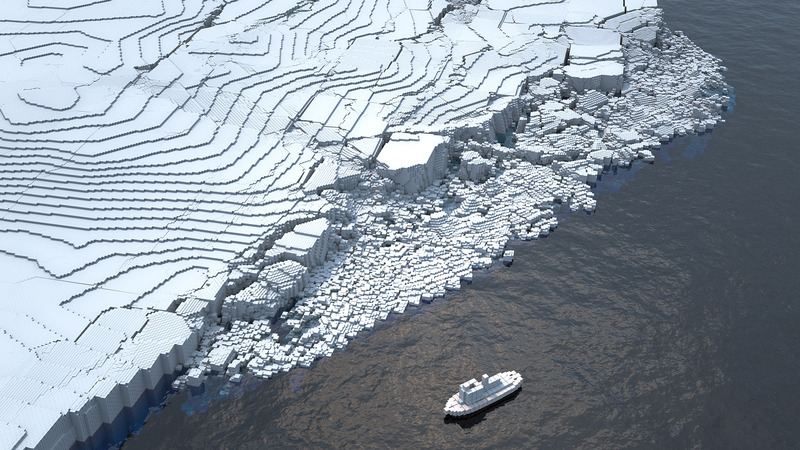 At the ice/ocean interface, glacier ice is lost through fracturing (i.e., iceberg calving) and melting in contact with the relatively warm ocean. The rates of this ice loss has increased in recent years, which has drawn significant attention within the glaciological community to the calving and submarine melting processes. However, there is much that we still need to understand about calving before we can reliably predict how rapidly glacier might calve in the future. For a newsletter targeted at a broad audience, Jeremy Bassis and I have summarized the existing research on iceberg calving, and some of the ways in which we can improve on our understanding of calving. The other articles within this newsletter summarize other perspectives on the relationship between the Greenland Ice Sheet and its surrounding oceans. The full newsletter, from which I’ve excerpted our piece on calving, is available here. I recently joined the UT Marine Geology and Geophysics field course on the Gulf of Mexico to learn about methods to study the seafloor. When deployed at the fronts of glaciers, these techniques can help us identify the stability of glaciers that end in the ocean. My research frequently draws on a wide variety of disciplines to answer questions about glacier behavior. Seafloor sediments not only reveal when a glacier last occupied a specific location, but rapid submarine sediment accumulation can help to stabilize a tidewater glacier terminus. When a terminus is in contact with a barrier of thick sediment, ice loss is decreased because the sediment can shield the glacier terminus from warm ocean water and reduce the rate of stretching at the glacier front. These topics are pertinent to the past, present, and future dynamics of ocean-terminating glaciers. While based out of Galveston, TX, I joined the UT MG&G field course for two days on a Gulf of Mexico research vessel. We acquired CHIRP and reflection seismic data to investigate the properties of the seafloor subsurface at two different scales/resolutions (~cm resolution for ~10 m, and ~m resolution for ~100 m). We also took vibracore samples of the top meter or so of the seafloor. Not only did I learn a great deal about the capabilities of these techniques, I had a lot of fun. Thanks to Dr. Sean Gulick, Dr. John Goff, Marcy Davis, and Dan Duncan for welcoming me to their program. I look forward to including these techniques in future research to better understand the dynamics of tidewater glaciers in Greenland, Alaska, and elsewhere. Deploying the CHIRP instrument to toe behind the vessel while underway. Securing a core barrel to the vibrating head that will sample the shallow seafloor sediments. Lowering the CHIRP off the back of the vessel. 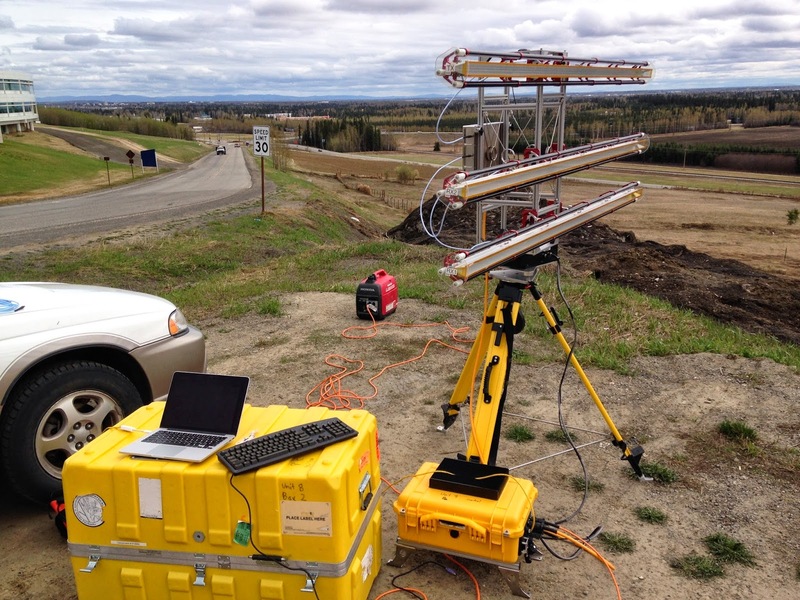 This week, I’ve been in Fairbanks learning how to use radar to gain an unprecedentedly sharp view of glacier motion. 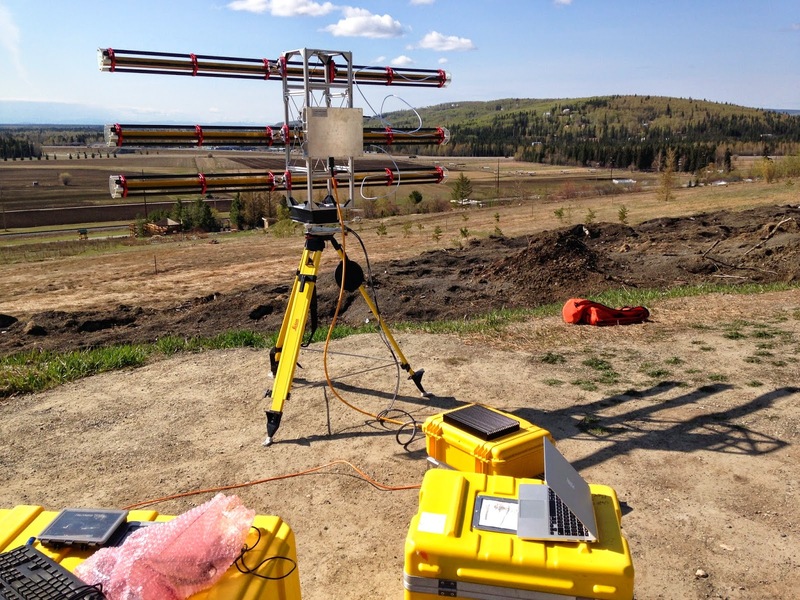 We’ll be deploying this technology in Greenland this summer. While camping at the terminus of Rink Isbrae (71.5 degrees N) for 8 days, we’ll be scanning the toe of the glacier every 3 minutes and recording motion between consecutive scans. Variations in glacier flow speed at these high frequencies can tell us about the forces that drive and resist glacier motion, as well as connections between motion and iceberg production. These data will support the broader project goal of understanding the factors controlling the retreat and acceleration of glaciers that flow into the ocean. Thanks go to Mark Fahnestock, a professor at the Geophysical Institute at the University of Alaska Fairbanks, for lending our Univ. of Texas and Univ. of Kansas team one of his new radar instruments for our fieldwork. A very nice summary of the main project I am working on has just been published here. With interviews and photos, Marcy Davis describes the goals for our work and the methods we’re employing to learn about the glaciers and ocean in West Greenland. Since arriving at UTIG in January, I’ve been continuing to explore how seismology can inform us about glacier behavior. Now, with the summer field season approaching, colleagues and I are preparing to return to Greenland and recover a year’s worth of data on tidewater glacier and fjord interactions. Planning is now in full swing with colleagues here at the University of Texas Institute for Geophysics, as well as the Univ. of Kansas, Univ. of Oregon, Oregon State Univ., and NASA, to return to the coast of western Greenland. Our teams of glaciologists and oceanographers will be in the field from mid-July through mid-August to collect data recorded since July 2013, and reset instruments for another year of remote operation. We all are excited to see how our equipment managed through the harsh winter at 71 degrees N, at the edge of the Greenland Ice Sheet. 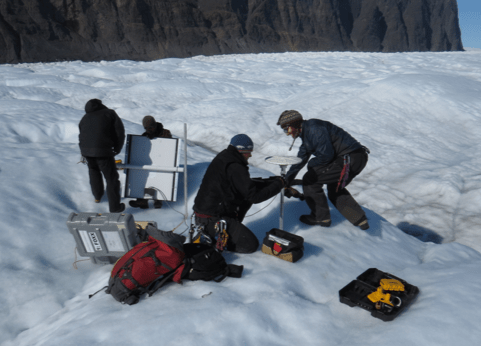 The data we collect will help us better understand some of the intricacies of glacier response to changing climate, and project how Greenland’s glaciers may continue to change in the face of ongoing climate change.